We don’t realize the importance of a generator until there is a power failure or outage. After all, generators are like insurance policies, we do not think about them until an incident happens. they just stay there silently in the background until the time comes that they are needed. Since generators are invaluable to us during a power outage, we must do our part to make sure they are maintained in top running condition. Having regular service and maintenance done on your stand-by generators can help it to function optimally and extends its lifespan. But, when generators do malfunction, it is advisable to always go to an experienced, certified professional for your stand-by generator repair or maintenance service. Bloomfield Cooling and Heating, Inc. has an excellent reputation, with many outstanding Google reviews from past clients that demonstrate our high quality standards and superior customer satisfaction. 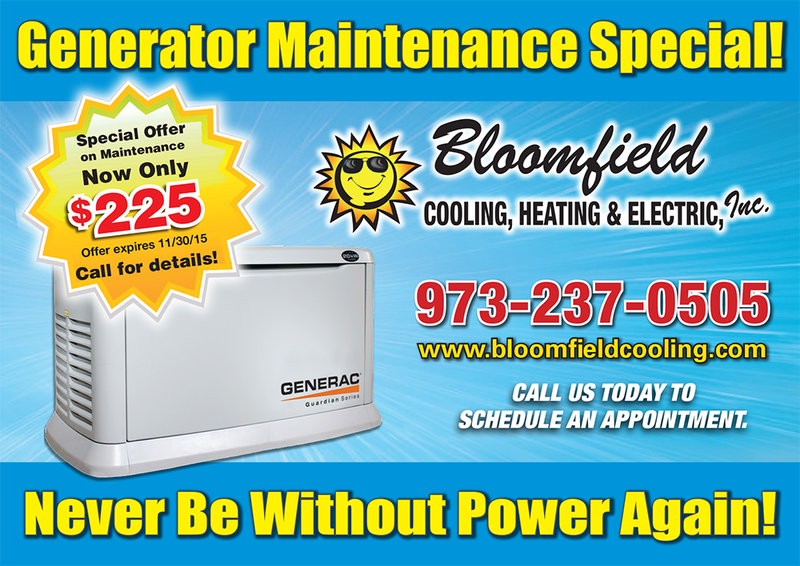 We offer stand-by generator repair, sales and maintenance in Bloomfield, NJ and surrounding neighborhoods. We take pride in our work from receiving a telephone inquiry to in-servicing how to run the stand-by generator at the completion of the installation. Bloomfield Cooling and Heating takes each job very seriously and strives for 100% customer satisfaction. We are capable of handling emergency situations! 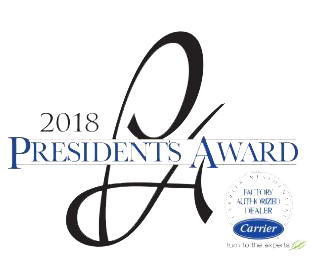 We deal with high quality Generac residential standby generators and treat our customers like neighbors. With Bloomfield Cooling, Heating and Electric, Inc., it is all about great service and affordable pricing. A standby generator provides an uninterrupted supply of electricity to the household. During any disruption of your power supply (i.e. power outage or failure), a well-functioning generator will instantly supply electricity to the house so you will not be left in the dark, the cold of winter or the heat of summer. 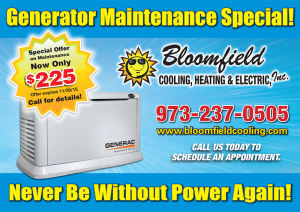 If you are interested in a free home survey or would like to learn more about purchasing a Generac stand-by generator, give us a call at Bloomfield Cooling and Heting, Inc..
We offer generator sales, maintenance and installations in Bloomfield, NJ. and surrounding Essex County. We provide reliable and highly efficient stand-by generators from Generac, a trustworthy and reputable brand that are capable of supplying the needed power to your home from 7kW to 22kW depending on your personal home needs. After we complete the installation, our certified technician will walk you through the basics and acquaint you with the features and functions of your new generator, including a simulated power outage. We also offer a reasonably priced maintenance program to ensure that your stand-by generator works effectively in the event of an emergency power outage. Bloomfield Cooling, Heating and Electric is your best source when it comes to reliable installation, repairs and maintenance service on your home stand-by generator in Bloomfield, NJ. We have been in business for almost 30 years.